The site of a fatal traffic accident near Silt on Aug. 16. A pickup truck was traveling 104 mph when it struck a Carbondale teacher’s car last month on Interstate 70 near Silt, killing the teacher and sending a state trooper flying into grass alongside the road. The pickup driver, Jeffrey Burk, 31, of New Castle, was arrested last week on charges including manslaughter and second-degree assault, both of which are class 4 felonies; and felony forgery for lying about a seizure disorder when he renewed his driver’s license, among other charges. “By lying … on his license renewal on July 3, 2017, to obtain a valid license after having the documented accident, he willfully and wantonly continued to disregard the safety of any and all motorists on Aug. 16, 2017, by operating his 2009 Dodge pickup,” Garfield County investigator Brian Sutton wrote in seeking a warrant for Burk’s arrest. Burk turned himself in to the Garfield County Jail after a warrant was issued Friday, the Garfield County Sheriff’s office said Monday. He was released on $100,000 bond. Burk, according to the affidavit, has a medical implant in his head to help fight his seizures. His parents told investigators that the implant was meant to wean him off medication that made him feel bad, and had helped reduce his seizures. He worked full-time in New Castle. Burk told authorities that he felt a seizure starting shortly before the crash that killed Shaw Lewis, a teacher at Ross Montessori school in Carbondale who lived in Rifle with his wife and two children. Hiller pulled over Lewis and had his head inside the passenger window of the Honda when, he told investigators, Burk’s white Dodge Ram smashed into the driver’s side of the car, killing Lewis immediately. Subsequent investigation showed that Burk’s Ram struck the left front of the patrol car, then plowed into Shaw’s Honda. A data recorder in the pickup showed its speed to be 104 mph a tenth of a second before its airbags deployed, the affidavit said. No braking was recorded in the 5 seconds before impact. 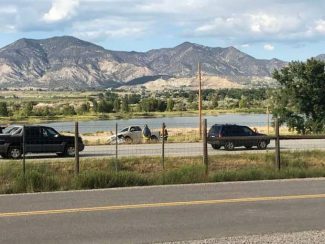 In the Vail accident 15 months earlier, Burk’s truck rear-ended a car on I-70, requiring the two women in that car to be treated for minor injuries. Burk was being treated for a possible seizure when police arrived. Passengers in the truck said they had been in stop-and-go traffic in a construction zone, and Burk suddenly hit the gas hard and was not responsive as they tried to get his attention. Burk told police he had a history of seizures, had been getting up early that week and lack of sleep can exacerbate his condition. He said he had taken his medication that morning. He had gotten the implant two months before, the affidavit said. The accident investigation also disclosed that Burk was ticketed for careless driving and failure to report an accident in a November 2015 accident in Glenwood Springs. In that incident, a car stopped for traffic in the 900 block of Grand Avenue was rear-ended by Burk’s white Dodge Ram, which left the scene. Burk reportedly told New Castle police when he was stopped that he didn’t know whether to stop or keep driving. He pleaded guilty to careless driving, and the failure to report citation was dropped.